If you're ever negotiating for a lease and you want tenant improvements done, put those on the landlord. It always costs more and it takes longer. When you're negotiating, keep things aligned in everybody’s mutual interest. 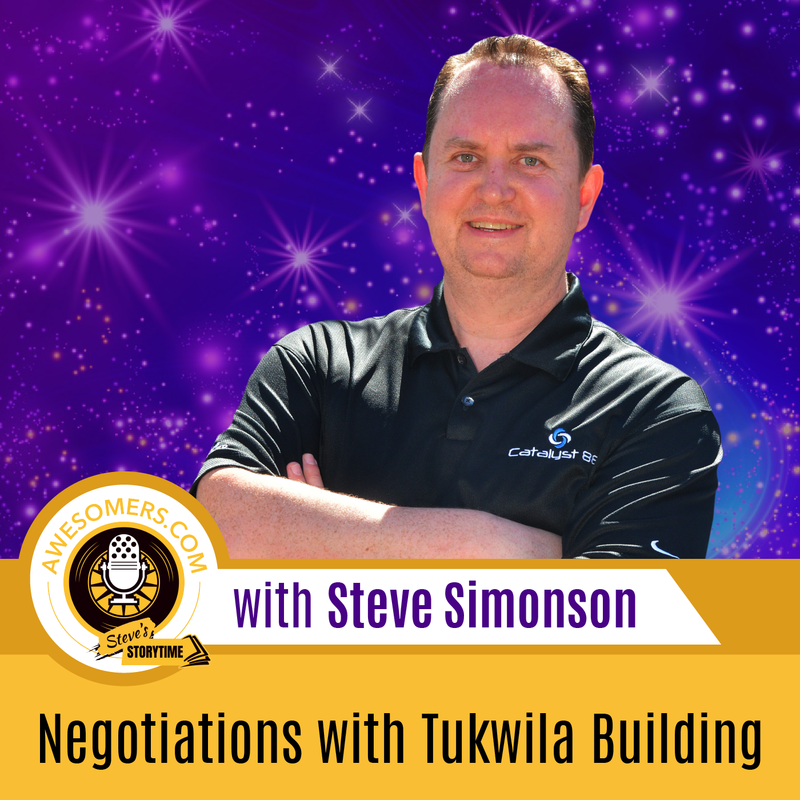 So listen and learn amazing negotiation tips and axioms from Steve’s experience. 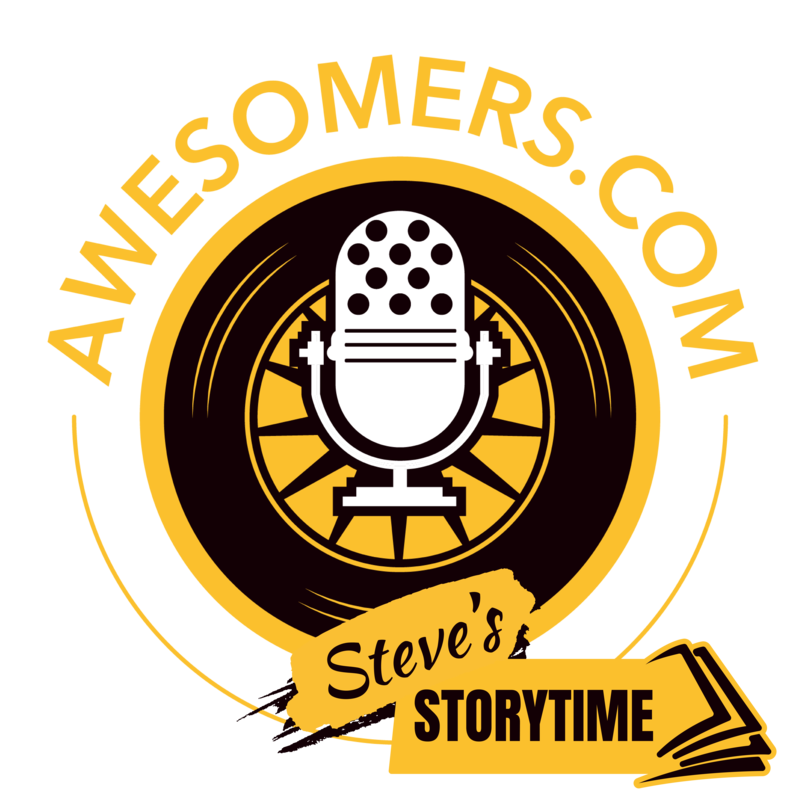 Steve: Everybody Steve Simonson back again with another Awesomers.com podcast and today is episode number 89 of our podcast series. All you need to do is run on over to Awesomers.com/89 to find out some of today's show notes and details and maybe even a transcript. Sometimes we flow transcripts in for you to make them easy to search. So today is a different kind of episode. We call it story time with Steve. Now what this means is I'm going to tell you kind of a story and experience and then try to give you a couple takeaways or maybe action steps that you can think about as it relates to your own business, your own life, from this story. So this is a story that I'm going to tell you and these stories are not in any particular order. It's just kind of what strikes my fancy at the time and in particular, today I need to record an episode so that we can keep the the publishing train running. As you may know, we've already published 88 episodes. That's a lot and we've done that in 88 days which is destroying my life, frankly. It's a lot of time and definitely is something that although I enjoy it while I'm doing it, the things that are pushing to the side are definitely starting to add up. So my point is, it's story time, I'm going to just kind of take you through an experience that I had tell you why I thought it was important and then of course you'll be able to investigate yourself whether or not you find that to be interesting. So first of all, this story is back in probably about the 2009 range. I had helped a Chinese company buy some assets of a bankrupt company and they were moving those assets from an old lease to a new lease. So just in terms of context, they had to get out of the old lease in a relatively fast order and when you do that, that puts a lot of pressure on getting a new lease. Now this is a Chinese owned company. They had no experience negotiating leases. They didn't know where to look, they didn't know what was the right type of location or the types of things that should be contemplated. So this is a whole separate story but let's just say they convinced me to help them. So I did. So the first thing that we did is we needed, we want to reduce the amount of footage required. So we only wanted to lease a 20,000 square-foot facility. So this was a light snack compared to the 60,000 feet that the acquired company held and we want to do that just for efficiency and to kind of have the the fixed overhead be as low as possible. So with lower space you're going to have challenges trying to squeeze everything in but we felt confident with our methods of stacking and racking that we would be okay. Further we had a team that was working out of the old location, small team maybe 10 people and we needed them to move as well and when you're trying to do all of this really fast, this is where negotiations kind of work against you. We'll talk more about negotiations perhaps in future episodes. But one of the the ideal situations if you're negotiating for something is to go into the situation where you can walk away right. Where you can just say, “No, not for me.” And you have time on your side. In this case, time was working against us. We did not have time on our side and we needed to kind of get this dialed in. So that was something working against us and working for the they would be landlords that we were checking out. So because this was 20,000 square feet, one of the little tricks of the trade if you will, is if you're setting up a warehouse and you're going to bring in a bunch of containers it's smart to put it as close to the port as you can and skipping any weigh stations if possible. And I'll just give you a little English on that, not to dive into too much detail but you know on some types of containers you can overweight them in China and then if they don't hit a weigh station in the US, then you're probably going to get away with a little extra weight on that container. Now, this is something not that I came up with but this is what the Chinese factory was insisting upon and so to meet their requirement, not having a weigh station in between the port and the warehouse was an essential component. Now, why do people overweight containers? Just as a little side note, they do it to get the lower cost per unit for shipping right. Your shipping costs essentially stays the same and the number of units kind of increases because you added the extra weight in there and that means the lower cost per unit for shipping and we're talking about small percentages. Today, it's hard and harder to get that to work in China because they have much more enforcement with with weight restrictions inside of China for their their roads. And if we've had that that strategy blow up on us later, just as a little aside where we were trying to ship a bunch of inbound containers on railways and a lot like somewhere in Texas, they finally got weighed and had to be broken down into smaller shipments and that costs a lot more than the simple savings. So one little lesson here is that you know as always, beware of unintended consequences. The China Factory was so insistent upon we have to overweight these containers and they didn't really think about what happens when things go inland or when the enforcement happens in a bigger way. And ultimately, it ends up costing them more money. So that's, one little lesson is and this is one of my axioms is beware of unintended consequences. When you do something, it can have a reaction that maybe you won't like at the other day. So anyway, back to looking for this location. So we found a few locations and in this case, it was down close to the Seattle area. And so we were going to bring things into the Port of Seattle or Port of Tacoma and we were going to land them in a little town called Kent or Tukwila Washington which is for those Amazon sellers, Kent is where Amazon just put up a huge facility. That's where Boeing a long time had big warehouses although they've surrendered some of those over the past 10-15 years. They've had massive, massive aircraft construction down in the Kent Valley. So we found a few buildings and we kind of zeroed in on one. And it was actually was two spaces of 10,000 square feet side to side. And so we went to the landlord and we said, “Hey, we would like this space but we we need to be able to drive our forklifts back and forth. So we'd sure appreciate it if you could just you know cut a big hole in the back of the building. You know where the two areas are connected.” Just imagine the back area - we'd cut like a 20 foot high by 20 foot wide hole in it so the forklifts could go through. And in actuality, one side of the building we were going to heat and the other side we were not going to heat. So we put some of the just plastic that is kind of like draping plastic, little sleeves of plastic and then the forklifts - goodness drive right through them. They can see what's on the other side because it's clear and it keeps the temperature locked in. And we were willing to pay for the plastic stuff which was you know two or three thousand bucks I don't remember. So we've got that big hole that needs to be cut out. We said, “Hey, in the front just put in a little door as well. You know, just so that the office workers in the front can get back. We were going to build a showroom in one part of the heated building and then have little offices in the other part to the house you know, five or ten people. I think ten initially and then it would go down to just office workers and then the showroom and sales team would be in the heated part of the the main structure. So anyway, long story short - we got into it with the landlord. They said, “Okay, great.” You know we finally agreed to a a per square foot rate that was reasonable to us and they said, “It will be something like $35,000 for the construction that you want done and as the landlord we are willing to pay for that. So we'll just give you a $35,000 credit and then you carry on and you pay for it going forward.” And because I've done a lot of leases I said, “No, no, no. It's your contractor. They said they can have it done in you know 45 days. They said it would cost $35,000. You manage them. We don't want to have anything to do with that part of it.” The landlord pushed back the couple ways but again I've negotiated dozens and dozens and dozens of leases of my time, probably been a part of at least 50 or 60 leases and these discussions. And you know, I just sort of stood strong I said, “That is one area you don't want to get.” So this is one big key takeaway, if you're ever negotiating for a lease and you want tenant improvements done, put those on the landlord. Have the landlord do them and manage them. And you're going to find out why as we go farther into this story. But first we're going to take a quick break. When we come back, we're going to talk a little bit more about how this conversation and negotiation went with the loan. We'll be right back after this. Steve: Okay, we're back again everybody and we're talking about well, we call it Steve storytime and we're talking about an old lease that I was negotiating on behalf of a Chinese factory who had acquired this company. So remember I said earlier in the story that we were under time pressure, we needed to move quick but we had just kind of negotiated this tenant improvement work that was going to take they said 45 days and any time a contractor tells you a time frame or even a price, you know you have to really treat that with suspicion. Because well it's my experience that construction projects don't always come in on time. And one of my other axioms is it always costs more and it takes longer. And that certainly was a factor here so with the landlord we said, “I tell you what, you guys be responsible for the tenant improvement work because they're your contractors. They came in and gave you the bid. They gave you the timeline but we really need to get early entry into this building so give us the right to go ahead and occupy right now and we'll just stay in the little office area and we'll put some some stock on either side of the building. We'll just keep our forklift separate and try to load out of each side of the building for the time being.” Very inefficient. in general you want to have, in a structure like that you want to have, inbound doors and outbound doors. And especially when you're bringing in inventory into two different areas, it doesn't make sense to try to run and in and out on both sides if you don't need to. That's why we wanted the doors cut. But nevertheless even being less efficient, that was a way to begin. So we started moving truck loads and truck loads of inventory over and I don't remember how many trucks, but it was you know 30, 40, 50 truck loads of material from point A to point B. And we're getting it all slotted in there so we have this right of early entry. Now one of the other things as I said, again all just based on experience and I'm sharing that experience with you is, not only is a landlord responsible for the contractors budget and timing but we're not going to initiate the lease until the contractor is done and until we are completed with the punch list, which is kind of the final checkpoint of a finished construction project. So once the punch list is done, then the lease will initiate and we said, “Because you guys say it would only be 45 days to kind of hold your feet to the fire and let everybody know that the stakes are high for every day that you're late, delivering the facility we want a day and a half of free rent basically.” Now where did I come up with the day and a half? A day and a half is kind of an arbitrary number. You can ask for two days, you can ask for one day, you may get no days but in our case we agreed on a day and a half as a penalty for any day that went that they were over. So for example if they were 10 days over we would get 15 days of free rent and this, just this purpose I'm starting to stammer on you there, but the purpose of this is to get alignment on the objectives with the landlord, the contractor and the tenant. Everybody wants the contractor out of there as quick as possible and the contractor you know they basically get paid on a bid basis so they want to get out as quick as I can and of course the landlord wants to collect rent so that's alignment of interest. So the big takeaway here is when you're negotiating, as long as things are in aligned with you know mutual interest, then it shouldn't be that hard of a request. In this context for example, when we said to the the landlord, “Hey, we really need early occupancy. This is a desperate you know situation for us.” We probably wouldn't use the word desperate by the way but we pointed out the urgency, the situation. They agreed and that was kind of them saying, “Hey, we really want your business. We're going to give you early occupancy.” We said, “Hey we really want this construction to go fast so you guys manage it. You handle your own contractor and as a little incentive, if you're late you know you got to give us some free rent.” And so that will kind of make everybody again with a line of interest so anyway, so we ended up moving in and got early occupancy. The contractor kind of twiddled their thumbs. It took him a little time to get permits and so they were probably, we were probably in the facility around 30 days plus before they even began and they had, they had estimated around 45 days for construction. So unless they could do the construction in 15 days, we're already going to be ahead of the game. When it comes to getting some free right and by the way during early occupancy, no rent is due. So these are not uncommon things to negotiate at least by the way, none of this was you know something that you know I made up by myself. This is all just kind of experiential stuff and remember that landlords, they think about the big long term picture right. So one of the countermeasures to that lease, is the lease one had initiated that's when the time of the lease, I don't remember it was a three or five year whatever it was, but that's when the time initiated. Excuse me. So what that means is, if they ended up having a lease, let's just say it took them you know a month to complete construction, our lease would initiate that month later. And that's when we would start paying rent and and that's when the lease you know 36 or 60 month term would begin based on that date. So the landlord's always thinking about long term anyway. All right, so anyway as we get into the project the contractor shows up and they say, “Okay, we're getting started.” They start doing some of the things that they need to do. It was relatively light construction right. The quote they gave of 35,000 to kind of hole in the back and cut a hole in the front, they were going to put up some little here stub walls inside of the the new showroom area so that there was a very clear delineation between the showroom in the warehouse and a little studio area. So it was a very basic operation and for commercial contractors, we didn't expect that it would be any big deal at all. In fact, it was still quite reasonable. They can have it knocked down in 15 days. So anyway, they show up, they start working, they're going slow and then like you can just tell the contractor, he's rubbing his head. He's frustrated. We're communicating with them every day but they or they don't really tell us what's up at first. So finally the contractor shows up, he's got the landlord with him or the rental agent, they use agencies and and so forth to do leases of big commercial places and basically they go, “Well, it turns out that big wall in between the structures, that's a shear wall and so we don't really want to put those those holes in that. We promise to put in you know the big one for the forklifts and the little one for the people.” And I'm like, “Well, I hear you. I don't know what a shear wall means from a construction standpoint but my impression is it just means that you're going to have to reinforce it a bit so you know c'est la vie. What are you going to do you?” Could tell I had my empathy on full-blast that day so they didn't really get into any of the detail so anyway they keep carrying on and now they're like, “Well, with the shear wall, it's going to take extra time.” And and we're saying, “Hey, we're going to stand your way out of construction zone as best we can.” And we're living with the construction noise and whatever else because we had early occupancy and it's fine we've already gotten our internet and stuff installed and in fact, we started with some wireless internet just so we could get into business the very first day. And we were slowly you know building up our infrastructure within the building. So to fast forward, it turns out that well... Actually I'm going to take another quick break and when I come back, I'm going to tell you exactly how much money or at least my best estimate for my brain how much money the construction costs, how long the delays were, and what the net impact was in a financial sense to us as the leaseholder right after this break. Steve: Okay, we're back again everybody. We’re drawing story time to a close here but I want to just set the backdrop again so you have full context. We moved to a new facility, it's about 20,000 square feet. We signed a longer-term lease, I don't remember if it's three years or five years to be honest with you but it had some rights to extend beyond whatever the initial term was. Anyway we got early occupancy. We also got you know some other things that they needed to do like put in a a ramp and and you know just various little TI things. TI means tenant improvement. So the contractor got a quote for that and said, “Hey, here we'll just give you the credit towards your rent. You manage the contractor and you just pay the bill out of the money we give you.” Which sounds perfectly reasonable right but because of my experience I'm like, “No, they're your contractor. They gave you the quote. You manage it. Give us early occupancy and by the way if you're late on construction, just give us a day and a half of rent credit for every day you're late.” So bear in mind that during early occupancy, we're paying no rent and during the construction we're paying no rent because it’s still early occupancy and then if they're late at any time, then we pay rent only after the day and a half penalty has been assessed for any late days. So anyway the contractor finally comes to us, not longer the construction and it goes, “You know, I don't know if you guys know this but to do the sheer wall, to do all this stuff the new quote, the change orders in the new estimate is closer to $250,000 which ultimately the construction end up going above $250,000 despite their original quote of $35,000. So right off the bat to get the project completed to our specifications, if we just took the $35,000 in credit, we would have been you know what is that 250,000 in the hole if we had to continue to carry on with the construction or abandon our requirements - both of which are terrible outcomes for us right. We wouldn't go in to a location and sign a lease if we couldn't get it the way it needed to be for an efficient operation. And again, I've been around. I know what I'm doing and the more importantly, the team that was involved with setting up the warehouse, they're brilliant and they understand how to move things efficiently. We just, we really had a plan so we said, “No landlord, you handle that and carry on.” So now their construction cost around 250,000 and after nine or ten months of construction, they've delayed us by at least 10 months, it probably ended up being close to one year of a delay. So we had early occupancy of the entire time. The rate on the lease was somewhere around fifteen or sixteen thousand a month plus triple net so it was probably close to eighteen thousand dollars a month for the space. The space might have been bigger than 20,000 square feet. It might have been 15,000 on each side, maybe it's 30,000 feet whatever it was, it was a good rate per foot for this location. And every month that we were going, we were saving you know 15 to $18,000 depending on whether you want to include triple net. By the way triple net is that, this was a building that was part of a long industrial complex and that includes things like property taxes and the lot maintenance and kind of the common things - roof maintenance things like that, that are common between all the tenants. They call that triple net and basically if you're ever negotiating at least be very very wary of triple net and make sure you understand it and you know negotiate it away as best you can. So, we're already let's say around a year into this thing and we're saving eighteen grand a month so that's $200,000. We saved, we missed the exposure of the 215,000 of construction overruns and then because they're a year late, they had to give us a year and a half of free rent right so for every day we got in a day and a half. So that's another year and a half that was another almost $300,000 worth of free rent. So here's the takeaway, so by the way if you do that three hundred thousand, two hundred thousand, and two hundred fifteen thousand you know you're at seven hundred fifteen thousand dollars roughly. Maybe my math is wrong. I'm just doing it in my head but over seven hundred thousand dollars potentially of savings because we understood some of the moving parts when you negotiate at least. Now let me just tell you, the landlord hated my guts. They hated my guts because they would come in and say, “Hey, you know the constructions close enough. Let's just tie this off and sign here and start paying rent.” And I would say, “No, no, the constructions not done. Here's all the things you agreed to. They're not done yet. When they're done, we'll start. Be done tomorrow. I don't care.” And what happened is as always in my experience, contractors get busy with other projects and they didn't have any penalties for finishing late so they would just get to us whenever they got to us. And again they were a professional commercial contractor. I don't have anything against them. The work was fine but they probably had lots of projects and it took them an awful long time to get to job done. All of this is to say and to reinforce some of those axioms. One, it always costs more and takes longer and to beware of unattended consequences and fundamentally, you know when we negotiate, we try to do it from a point of alignment so that all people are aligned but not necessarily a point of fairness right. I want to make sure that I'm honoring my fiduciary responsibilities. In this case, it was a Chinese owned company. They still really don't have a full understanding of the $700,000 that I saved them because they just, they're like, “Hey, yes you got it under control. Take care of it. Thanks. Thanks for everything.” But that was a massive amount of money that I saved them and ultimately all that, the use of the facility and the time to build up the business and so forth after the acquisition was really additive to that business. So anyway this has been story time with Steve. This is the time that I saved $700,000 on a lease and did it with I would say a positive spirit although the landlord hated me at the end. You know it was plain as day and that when I kept telling the landlord because at the end things got heated, not at the end when we were trying to initiate the lease. Things got heated about is the punch list done or not right. We're right down to the details and we were being, I thought we were being fair. They felt we were being unfair to be honest. And but I said, “No, we're being fair.” And what I know is fair is written down in this lease agreement and I guarantee you if for one one second of one ounce of one degree of anything on that lease, if we were out of compliance they would have beat us down like you cannot believe. You know people will, you know they always talk nice and know this and that but at the end of the day, it comes down to what's written on the contract. So don't forget that you know your rights are just as important as anybody else's and that landlord who's trying to intimidate us and trying to you know prowl beat us into kind of signing early, it's like honor your agreement and we’ll honor ours. That's as simple as it is and so there you go. That's the moral of the story you know. Know what you want, be very careful of things that could be unknowns like accepting $35,000 for construction that ends up costing 250,000 more, be mindful of the the timing and be mindful of just little tiny tweaks like early occupancy that may be able to help you get through you know a tense position. Okay, I hope you enjoyed the story time with Steve. We are going to remind you that this is episode number 89 of the Awesomers.com podcast series and just go to Awesomers.com/89 to see today's show notes and details. Thanks everybody!